This week's Stampin'B hostess was Joanne, who challenged us to make a blue monochromatic card, with an additional requirement of paper piecing. 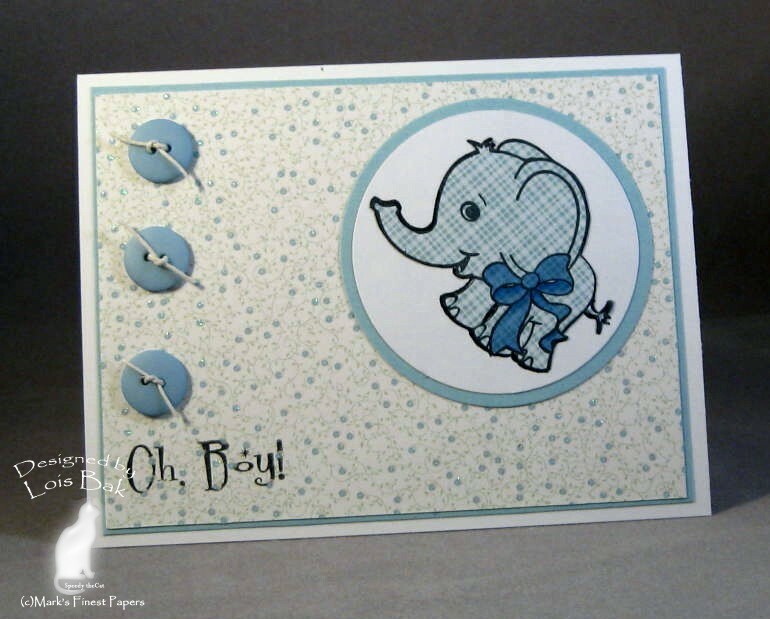 I chose this cute little elephant from Mark's Finest Papers new set Oh Boy, It's a Girl! 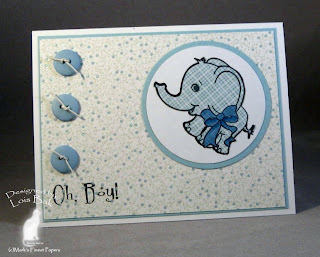 I stamped him on a white scrap and cut it out with a circle nestie. Then I stamped it again on the DCWV Nursery DP, cut it out, and colored the ribbon. I didn't want to take too much away from him, so I just added some blue buttons for embellishment. The background DP is from the same paper pad, matted on MFP Breezy Blue. Now, if I knew someone who just had a baby boy, I'd be ready! 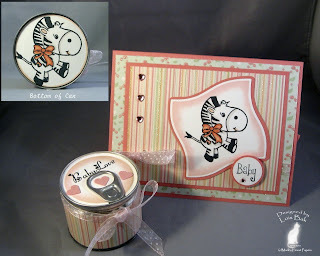 Today's Featured Stamper on Splitcoaststampers is Shelly (Freshn'Sassy). 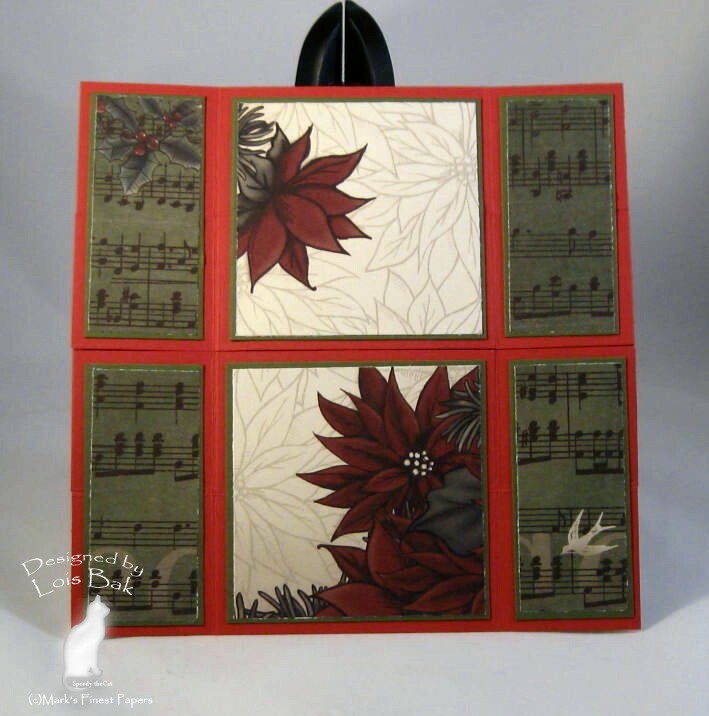 In looking through Shelly's gallery, I saw several Never-ending cards, a technique I had not done before. There are several tutorials on-line for this technique -- one of them has a video. What better way to try a new technique than by CASEing someone else. So even though today is Easter, I decided to do a Christmas card. 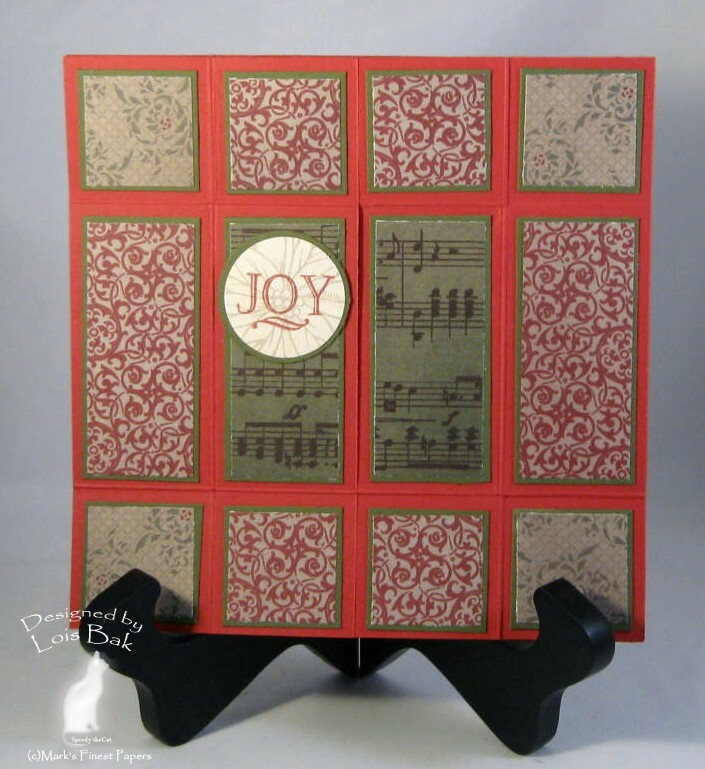 The card base is made with Mark's Finest Papers' Red Hots (a 100-pound cardstock) and the designer papers are from Stampin'Up's Deck the Halls DSP, matted on MFP Deep Olive. 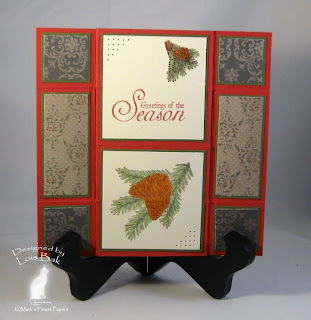 Very little stamping on the front -- just the JOY from MFP's Seasonal Poinsettias. When you open the first fold, this is what you find. The images are from MFP Greetings of the Season. 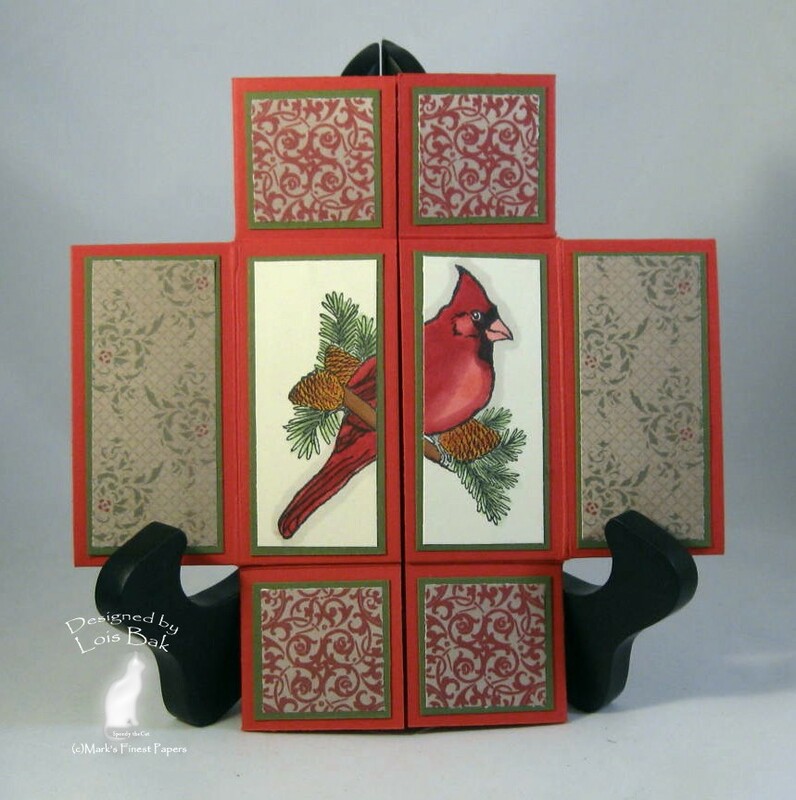 For the second fold, I stamped the cardinal and split him in half so he would fit on the two vertical panels. The back of the card is just designed paper. Even though I had fun making this card, I'm not sure I'll ever try it again. But I had to be able to say that I did it at least once! Vicki Dutcher was the hostess for this week's Stampin' Bs challenge; and, because Mother's Day is coming up in a few weeks, she asked us to make a Mother's Day card. I used the large iris from Mark's Finest Papers' brand-new set Bearded Iris and colored it with Copic markers. After cutting it out with a Spellbinders Petite Oval Nestabilities die, I sponged around the edge with Tim Holtz Distressed Wild Honey. The background paper is SU Apricot Appeal DSP. I added a ribbon and stickpin. 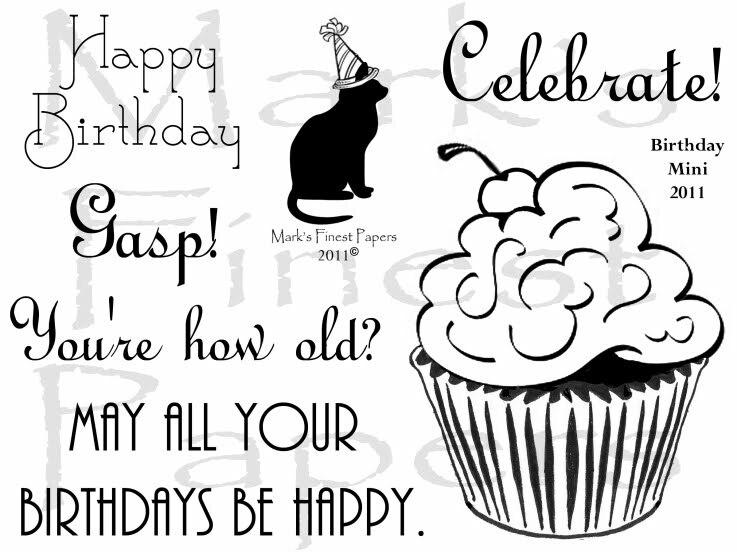 How would you like to have a little fun and get a FREE stamp set from Mark's Finest Papers. MFP is hosting a Birthday Card swap over on Splitcoaststampers, and everyone who joins the swap will receive this mini-set. To be able to participate in the swap, you have to be part of the Swap Users Group on SCS. If you aren't a member yet, here is a link to how to become a member. MFP is going to have on-going swaps; and each time you join, you'll get another free stamp set. So, in addition to the beautiful cards you receive from fellow swappers, you'll get a BONUS! 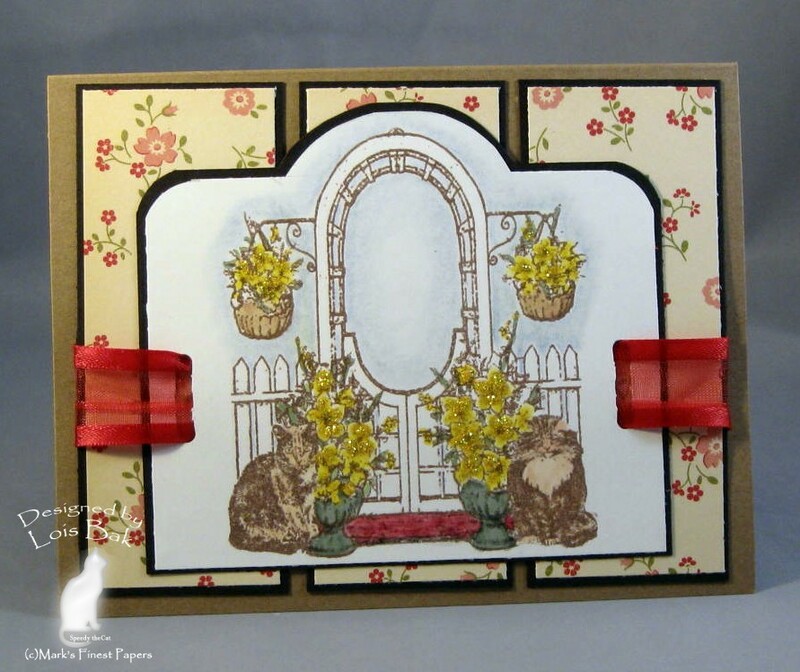 Welcome to the MFP April Blog Hop! This month, we are releasing 4 NEW SETS! 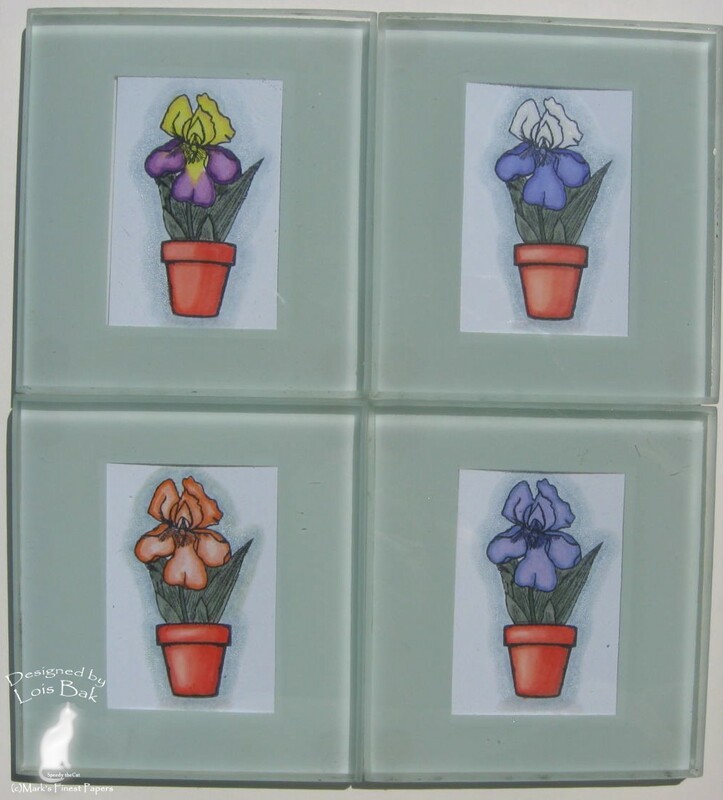 Our New Sets are: In My Mother's Garden, Bearded Iris, Oh Boy, It's a Girl and Garden Fairies.For your convenience, all 4 stamp sets are available for purchase TODAY! What do you need to do to qualify? Just comment on the Design Team blogs during the blog hop. The winner will be announced on the Mark’s Finest Papers blog on Saturday, April 16, 2011. ***See the MFP blog for all the contest rules and PRIZES! I'm not part of the official Blog Hop today, but thanks for stopping by to look at my creations. I had fun with the Garden Fairies set. My card has lots of glitter. 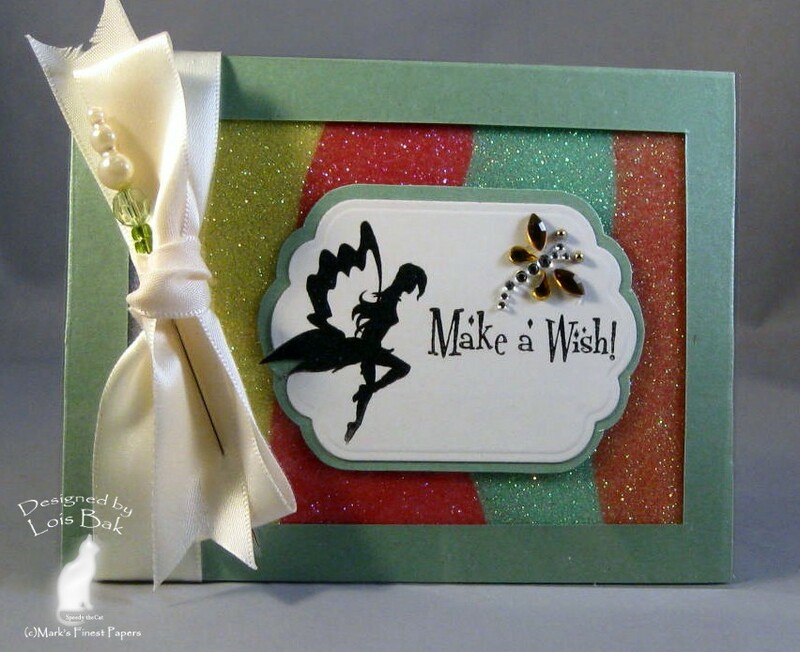 I had made a glitter card once before and loved the way it turned out, and I thought a fairy needed lots of glitter in her life. After making the background, I placed a sheet of acetate over the "frame" and attached it with the ribbon. Then I placed the stamped diecut on top of the acetate and added a little bling! My box was made as a gift to a co-worker who has been having many health problems, and I wanted to make her feel a little better. She loves fairies -- has all kinds of them all over her office. I had received some Christmas cookies in the box and kept it because I liked the unusual shape. I just covered the lid and added the stamped fairy, which is colored with Prismacolor pencils and Gamsol. I wrapped some ribbon around the edge of the lid and across the top, adding a bow and a flower. I gave it to her last week, and she loved it. I am so glad! My brother-in-law gave me these Lladro-like clowns for Christmas many years ago. 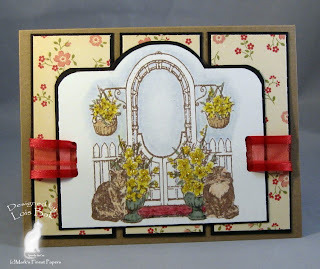 Be sure to visit the "official" blog hop stops and comment in order to be eligible to win a guest designer position for Mark's Finest Papers. Be sure to check out the MFP Swap on Splitcoast. If you have any MFP stamps, you might like to join us. 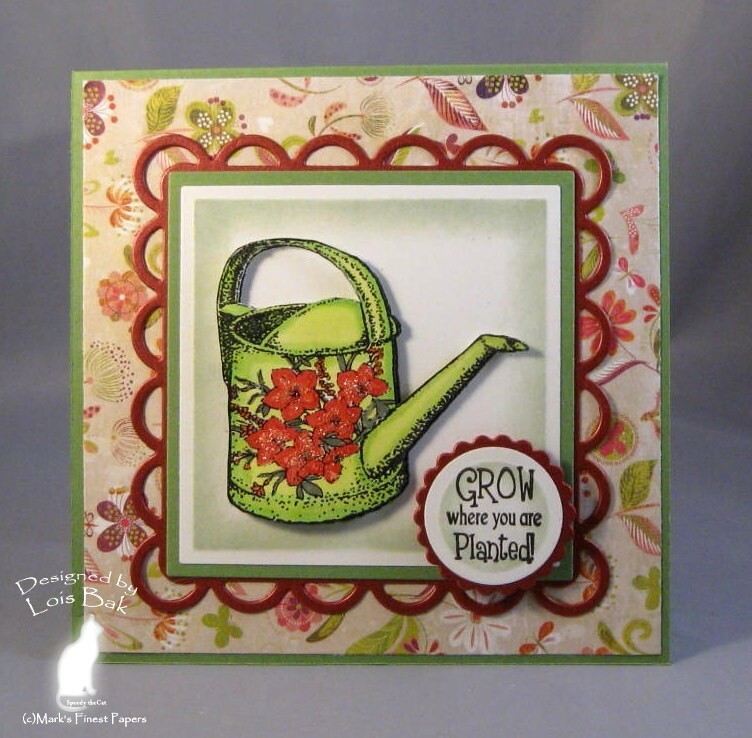 My first card for today's set, In My Mother's Garden, is for both the MFP Blog Hop and the Stampin'Bs challenge. I was the hostess for this week's challenge -- my challenge was to use a square, a circle and an oval somewhere on your card. My square is obvious -- it's a square card. In addition, I used the lacey square Nestabilities die to make a border around the image panel. The circle also is pretty obvious -- the sentiment is on a circle nestie. The oval is a little less obvious. If you take a look at the top of the watering can, you will see it is an oval-shaped can. I hope that's not cheating. Of course, it's not cheating -- the hostess of the challenge would NEVER cheat! I actually stamped the watering can twice, popping up the second (colored) image and adding some stickles to the flowers. The background paper is from Basic Grey's Green at Heart paper pad. My second card needs very little explanation. After stamping the trellis I cut the top to go around the trellis and matted it with MFP Dark Chocolate Bar. All coloring was done with Prismacolor pencils and Gamsol. 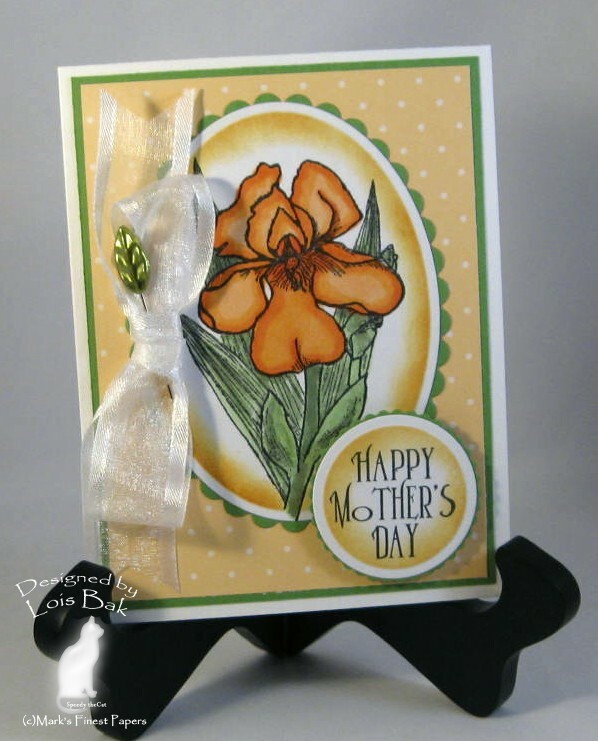 There are also stickles on the flowers of this card. Like the clown on Tuesday's post, this clown was also made by my mother. (Crafting is in my genes, you see.) She knew I loved Elvis, so she found some material with Elvis' image all over it and made the stuffed clown. 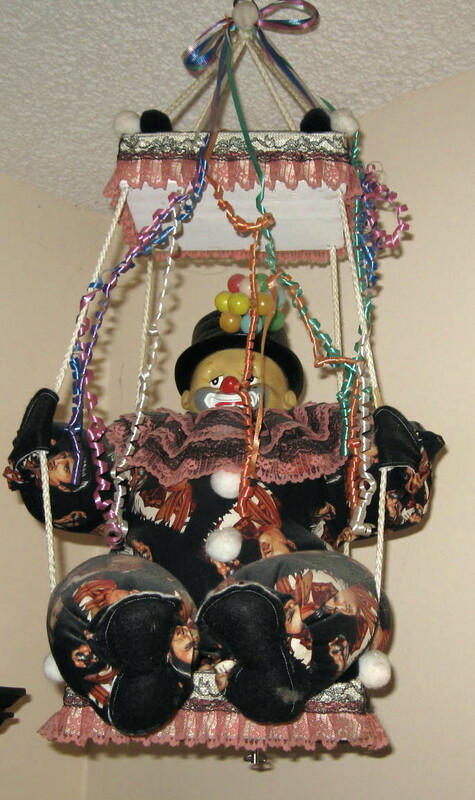 This trapeze is hanging in a corner of my dining room. Be sure to check out the rest of the team's creations using In My Mother's Garden. Comment on each post to be in the running for a guest designer position with Mark's Finest Papers. And be sure to check out the MFP Swap on Splitcoast. If you have any MFP stamps, you might want to join us. What do you need to do to qualify? Just comment on the Design Team blogs during the blog hop. The winner will be announced on the Mark’s Finest Papers blog on Saturday, April 16, 2011. ***See the MFP blog for all the contest rules and PRIZES! I recently joined Technique Junkies, a subscription newsletter, which is chock-full of fun techniques. My first card was made with one of these techniques. As you can see in the second photo, there are a series of messages tucked inside the card. 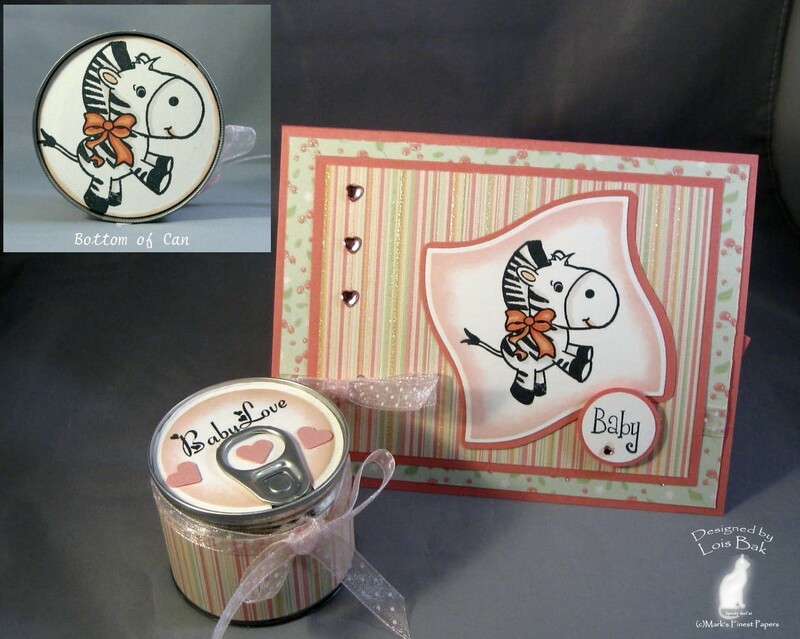 This card set was originally made as a baby shower gift. However, baby had other ideas; and she was born by C-section the day before the baby shower! Inside the little can is a pair of baby socks. There is a tutorial on SCS for this pop top container. 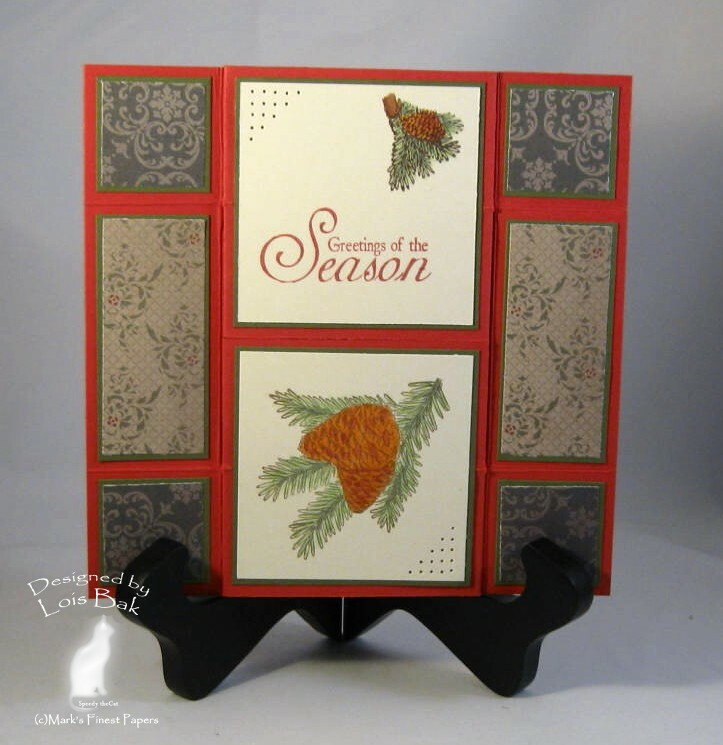 My second card is a little simpler, with a color-blocked background, which I ran through my Cuttlebug using the Lattice Square embossing folder. I found some Colorbok Sticky Stitches somewhere (don't even remember where!) and ran strips along the edges of each of the different color blocks. I thought it sort-of looked like a baby blanket. The cute little giraffe panel is popped up on dimensionals. In the real world I am a bookkeeper. 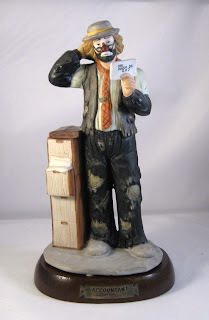 My son Doug gave me this Emmett Kelly accountant figurine for Christmas one year. I actually have several Emmett Kelly clowns in my collection. Be sure to visit all the participating blogs today and comment in order to be eligible for the opportunity to be a guest designer next month. And be sure to check out the MFP Swap on Splitcoast. If you have any MFP stamps, you might want to join us. 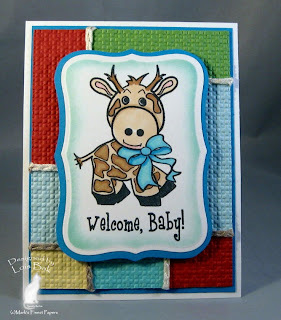 Welcome to the MFP April Blog Hop! This month, we are releasing 4 NEW SETS! 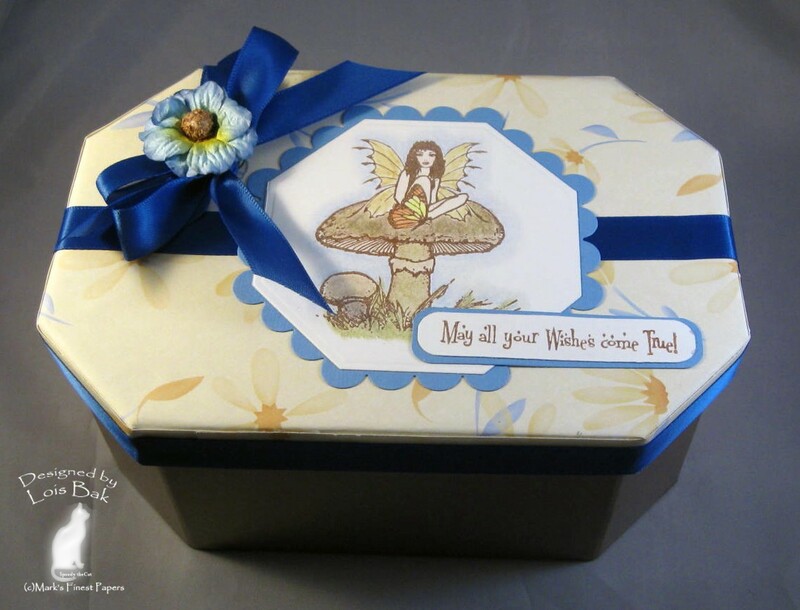 Our New Sets are: In My Mother's Garden, Bearded Iris, Oh Boy, It's a Girl and Garden Fairies.For your convenience, all 4 stamp sets are available for purchase TODAY! We have a NEW Blog Candy Contest! BE A GUEST DESIGNER! *** What do you need to do to qualify? Just comment on the Design Team blogs during the blog hop. The winner will be announced on the Mark’s Finest Papers blog on Saturday, April 16, 2011. 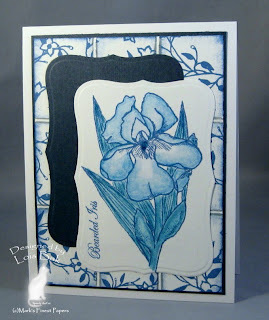 My card for today's set, Bearded Iris, was made using the Delft Tile Technique, which was spotlighted on SCS a couple of week's ago. 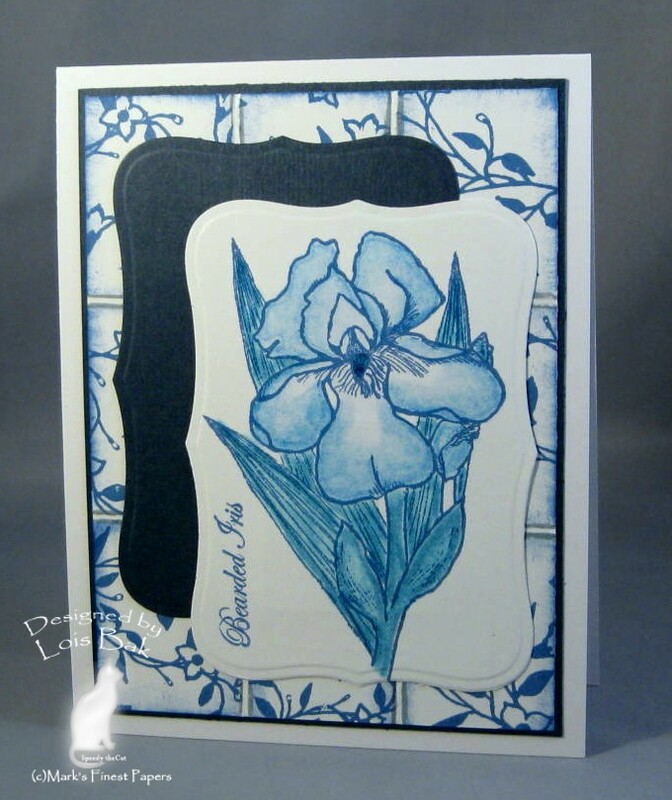 After following the tutorial directions for making the background, I cut a Labels Eight die cut in MFP Dark Night Navy and another one from the Snow Storm Smooth piece on which I had colored my large iris. 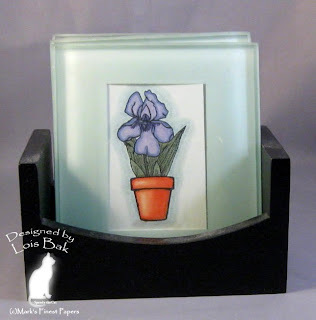 After seeing Geri's animal tiles she made using the MFP African Veldt set, I was inspired to use a set of coasters my sister had given me several years ago, which had sat dormant in my supply closet. 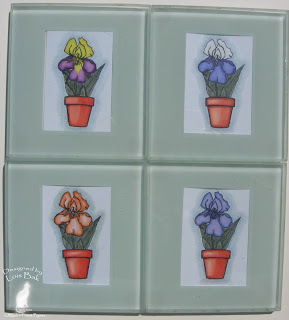 I stamped the potted iris four times, coloring each one differently -- after I had Googled "Bearded Iris" on the internet to get four different varieties. This is a photo of all four coasters. 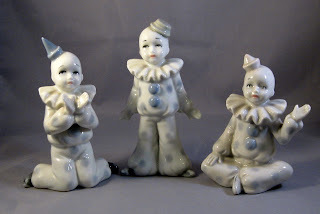 I had shared some of my salt and pepper shaker collection with you previously, so I decided to share some of my clown collection too. 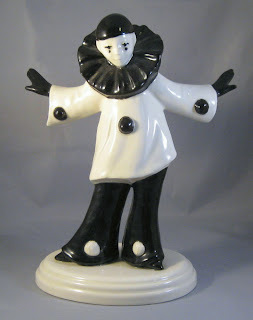 This is the first clown I received. It was a gift from my mother, who did marvelous creations in ceramics. I have many of her pieces throughout my house. Make sure you stop by all the design team's blogs and comment in order to be eligible for the wonderful opportunity to become a guest designer for Mark's Finest Papers. There was a little confusion as to exactly what this week’s Stampin’Bs challenge was. What was definite was the colors required – Navy and Green. 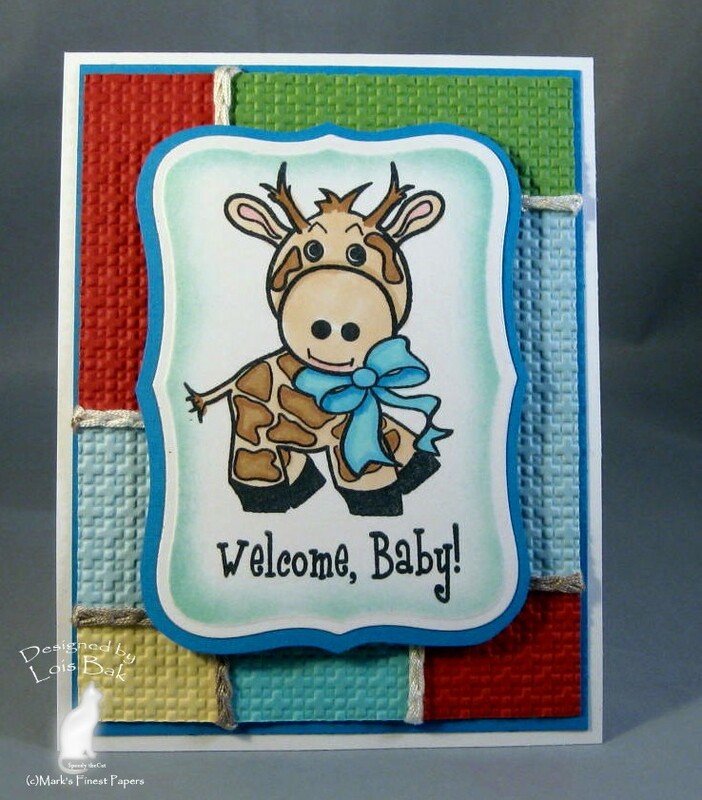 What was a little blurry was whether the card should include stripes – or dots – or plaids. So the hostess, Emily, decided to make any one of those three okay. I chose my favorite pattern -- plaid. I found some navy and green plaid DP in my “blue” drawer. It was quite masculine-looking, so I went with a masculine card. My card base is Navy, matted with a Light Green (MFP Pistachio Fleck). 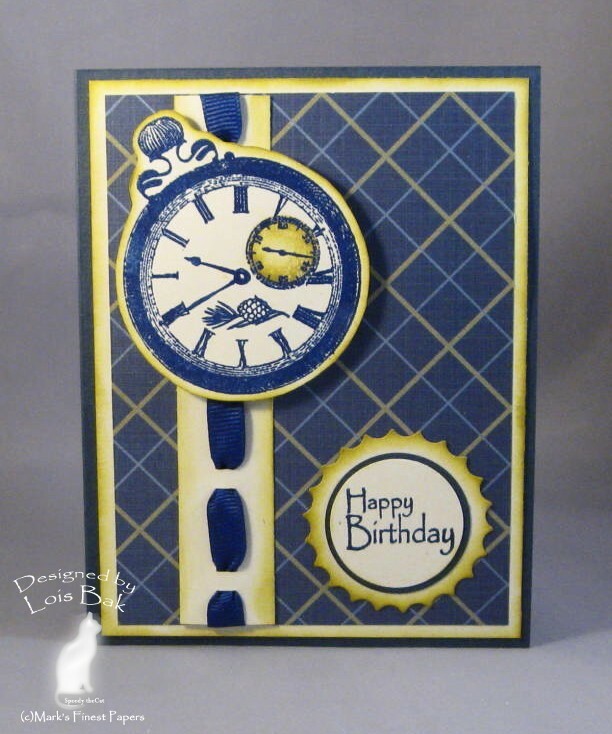 I stamped the pocket watch with Versafine Majestic Blue and clear embossed it. After cutting out the watch (leaving a little bit of the pistachio showing), I popped it up on dimensionals. Both the vertical piece and the sentiment circle have some distress sponging.